Deloris Fae Smith passed away on June 8, 2018, in Webster City. She was born July 12, 1928, in Blairsburg, Iowa. She attended school in Blairsburg until high school, when the family moved to a farm north of Webster City in 1944. She graduated from Lincoln High in Webster City in 1947. After that, she attended the Minnesota Bible College in Minneapolis for a year. From birth, Deloris suffered from cerebral palsy. However, her indomitable spirit and bright intelligence greatly mitigated the impact of the affliction on her life. She learned to ride a bicycle at a young age, with the loving assistance and support of her father. He also taught her to drive a tractor and didn’t get upset when she drove it through a farm gate. Due to his patience, she became a great help with the farm. 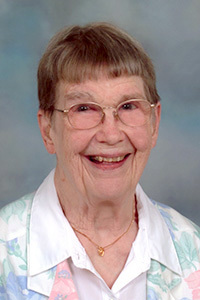 Deloris was an avid reader of a wide variety of books, and she was a constant patron of the Webster City Public Library. She learned to knit and crochet and produced many items for family and friends, which we all found remarkable, given her disability. She was also an avid basketball fan, who watched every game she could when Iowa State, UNI, and the University of Iowa played. Deloris was preceded in death by her parents Charlie and Jennie Smith and her step-mother Edith, as well as her sister Leta. She is survived by her two nephews, Michael and Stephen Wingert, and by Stephen’s wife Marilee, their son Jeremy and daughter Anya, and their two granddaughters Katherine and Caroline. When her grandnephew Jeremy commented to her on a recent visit that he really respected how well she had coped with her handicap, she responded, “I’m not handicapped. I’ve just got problems like everyone else.” Clearly, she took the teaching of her church to heart and was a worthy example for all. A memorial service will be held at the Webster City Church of Christ on Monday, July 9th, 2018 at 2 PM with a reception to follow. In lieu of flowers, memorials may be donated to the church.